Craigslist pet ads are annoying me to no end lately… I try and try to stay off of the site in general, but I am drawn to it. 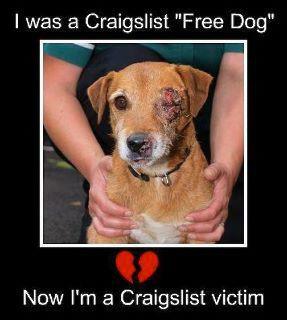 Trying to put the emotional stuff aside, here are some of the dangers that can befall a pet sold on Craigslist. Animal Abusers, Puppy Mill owners, dog fighters and “bunchers” scan these free ads to find animals that they are then able to use and abuse for their own pleasure. Most of these people are too cheap to spend money on these animals (because they have no value, in their eyes), so even a small rehoming fee will turn them off. Merely putting “rehoming fee” in your ad will scare them off. As you may be aware, animals given away for free can, and unfortunately often do, meet gruesome fates. They can end up in the hands of animal abusers like Barry Herbeck, a Wisconsin man who was convicted of torturing and killing animals he obtained through “free to good home” ads. He confessed to taking his kids with him when responding to the ads so people would be comfortable turning animals over to him. There are many stories like this where people will get free animals just to torture them. Most recently, is the story of “Puppy Doe”- or Kiya. She was tortured medieval style and had to be euthanized due to her condition. Then there are the people known as “bunchers”. These are the ones who obtain animals illegally from random sources to sell to research facilities for profit. There is proof that they often acquire animals by answering “free to good home” ads. Small animals advertised as “free to good home” are sometimes acquired by individuals who intend to use them as bait in training other animals to fight. Gerbils, hamsters, and young kittens are often acquired to be used as snake food. An even worse fate are those animals that end up being used as bait dogs. Yes, it happens- Even in Iowa. Bait animals are completely disposable, because they are just going to be tortured. Bait dogs are used to train dogs in dog fighting rings. The business itself is an awful one, but the fate of these “bait animals” is more terrible than I can put in to words. So even a $30 rehoming fee scares these guys off. They aren’t in it for the profit that they can make off of your animal, just the profit they can get from the viciousness of their own animal. I wrote another article about “dog flipping”, which consists of people scanning the free pet ads so they can resell the animal at a higher price. For more information on that, click here. I urge you to click on this link and read more. Animal protection organizations all over the United States work diligently to educate people about the proper procedure for placing animals and frequently assist people in finding good homes for their animals. For example, Bailing Out Benji routinely contacts individuals who place “free to good home” advertisements and I try to educate the person on potential perils for their animals and have sometimes received replies from people who say they never knew these dangers existed. I also make it a point to contact the owners that are selling their unaltered dogs. I very politely explain to them that not only is it irresponsible to have an unaltered pet in this day and age, what with the pet overpopulation, but I take this opportunity to talk to them about puppy mills. With Iowa being the second worse state in the nation when it comes to puppy mills, why make it easy for the breeder to add new blood to their operation? Not to mention ALL of the backyard breeders just looking to make a quick buck. If you would like more information about what to say to these types of ads, feel free to contact me at bailingoutbenji@gmail.com. If you are one of those people who HAS to get rid of their pet, then please, please PLEASE be careful. I suggest contacting your local shelter or rescue and asking if they will help you find a new home for the animal. More often than not, the rescuer will have very good advice to give you. They might even be able to list the animal on petfinder, while it stays in your home. Advertise through friends, neighbors, and local veterinarians first. Your chances of finding a good home are increased when you check references with someone you know. Ask for a vet reference: If the person can give you the name of their vet and they are in good standing with past pets– they are more than likely a good place to live. This is a very easy way to find out how quickly this family moves through animals. CONTACT THE LANDLORD!!! It is so important to make sure the person can even have a dog. More often than not, people get the animal before getting the permission. Carefully consider all the elements of the new home:Will your pet get along with small children? Is the family planning to keep the dog chained outside as a watch dog? Will the cat be kept only as a mouser? Do not be shy about asking questions. Your pet’s life and happiness may depend on it. Have your pet neutered or spayed before he or she goes to the new home. This will make the animal more adoptable and help stop irresponsible breeding. At least ask the new person to do it! Just remember, if you choose the wrong home for your pet you are signing their death warrant- or worse- sending them off into a lifetime of torture and abuse. As always.. another great source of information for people. So many people don’t know where to turn when having to rehome a pet for a valid reason and they think they may find a good home thru Craigslist. Taking to the shelter or otherwise means having their pet put down, (that’s the belief’s of many) and only because they are not educated on the subject. You’re doing a great job at teaching. Let’s hope the words get around to alot of people. This is surely a great start. Thanks again, Mindi..
With this such a common scenario, you think you could find one, or a few dozen examples, perhaps even a few in Iowa. Good article, and the information is well worth repeating! A few friends and I saw a dog for free on Craig’s List and tried to rescue it. He was a young purebred mastiff breed (South African Boerboel), so we knew he would get a lot of interest from people who may not have his best interests at heart. 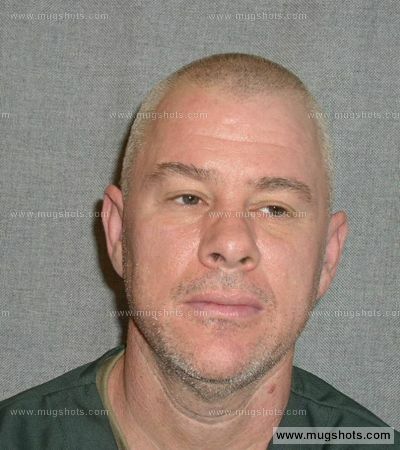 Unfortunately, a convicted animal abuser got there first within a few hours after the Craig’s List ad was posted. Sadly, she euthanized the dog within 6 hours after taking possession of him. RIP, Moses. The owners were devastated when they found out, and had no idea that they turned their dog over to a convicted animal abuser. I had no idea this was going on. It is unfortunate that people feel the desire to hurt these defenseless little creatures, let alone what would possess them to do such things. I have been looking for a cat on Craigslist. About a year or so ago my cat died of old age (she was about 16 or 17 years old). I finally feel ready to get another cat, and it pains my heart to hear that people could do this. I bought two birds from Craigslist and they were the best purchases of my life. There are some good people out there. You just have to be careful. I will not re-home any animal until I have met the person and seen where they live. In my area, DFW, Craigslist does not advertise or post ads for animals. I never understood the reason before. Now Im glad! Thank you for the great information! Is there a way to post a warning on Craig’s list in the pet section? Yes! just create a post in your local section and you can easily copy/paste this article within it!